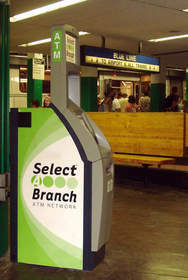 KING OF PRUSSIA, PA--(Marketwire - July 15, 2008) - Today Select-A-Branch ATM Network, LLC ("S-A-B") announced that the company has completed installation of ten S-A-B ATMs at commuter rail stations in and around Boston. The contract was awarded by the Massachusetts Bay Transit Authority -- MBTA. "The MBTA is dedicated to providing a positive, affordable transportation experience to its riders," commented Chris Geiger, S-A-B EVP Sales. "And the S-A-B business model allows the MBTA to reach outside of the single bank paradigm to please a larger audience. As of today, S-A-B has sixteen participant financial institutions, including TD Bank, one of the largest institutions in the northeast." S-A-B ATMs are equipped with the company's patent-pending software, which allows multiple financial institutions to deliver branded transactions and ad campaigns through each ATM. When the card holder of a participating institution swipes their card at any S-A-B ATM, they are instantly presented with transaction screens branded with the logo, colors and marketing messages of that particular institution. The surcharge is then shifted to the institution, resulting in a surcharge-free transaction to the card holder. The benefits to the MBTA are twofold. First, as more banks and credit unions join S-A-B, an increasing number of card holders will enjoy finding surcharge-free transactions at the MBTA locations. Second, S-A-B provides an increased revenue stream to the MBTA. "Banks and credit unions are obliged to provide surcharge-free transactions to their own card holders, resulting in a revenue stream based on approximately fifty to sixty percent of the transaction volume," commented Dan Stechow, S-A-B Chief Operating Officer. "But at S-A-B ATMs, transactions performed by card holders of participating institutions are paid for by those institutions. Customers of non-participant institutions pay the surcharge themselves, as they would at any generic ATM. The resulting one hundred percent surcharge model can, over time, dramatically increase the revenues of a given location." Select-A-Branch's footprint is currently concentrated up and down the east coast, including the Pennsylvania Turnpike and over 100 McDonald's franchise restaurants throughout New York City. Bostonians can now access S-A-B's green machines at many MBTA locations, including Harvard Square Station, Downtown Crossing and North Station. For an up-to-the-minute list of S-A-B locations please visit http://www.selectabranch.com/SAB_ATM_Locations.pdf. The MBTA remains the nation's 5th largest mass transit system. It serves a population of 4,667,555 (2000 census) in 175 cities and towns with an area of 3,244 square miles. The average weekday ridership for the entire system is approximately 1.1 million passenger trips. The MBTA can look back on a tradition of three hundred years of continuous mass transportation services. While claiming to be America's oldest subway, it still remains the vibrant life stream of Boston and Eastern Massachusetts.